Federal prosecutors have accused José Susumo Azano Matsura of illegally funneling more than a half-million dollars to San Diego political campaigns. That's the least interesting part of his story. On a late Friday afternoon in February 2011, dozens of police officers carrying assault rifles arrived at Sempra Energy’s $1 billion liquefied natural gas plant on the coast of Baja California, Mexico. The officers, dressed in ski masks and body armor, cut the chains on the plant’s gates. Once they had broken in, the police put their own seals on the gates. The cops drove down a winding road through brown, brush-filled hillside. Just before reaching the facility’s entrance, the officers passed a swath of land that looked as barren and uninhabited as its surroundings. That piece of property wasn’t as innocuous as it seemed. Five years earlier, Sempra had purchased title to the land. The transaction was one of the final pieces to build its plant, a facility that would allow the company to pump imported gas to millions of homes and businesses on both sides of the border. But a rancher believed the land was his and accused Sempra of knowingly buying a fake deed to steal it from him. He was fighting to get the land back. The mayor of Ensenada had listened to the rancher’s complaint, and eventually sent the city’s police force to storm the Sempra plant. At first glance, this looks like your typical David-vs.-Goliath tale: a large American company against a lone Mexican landowner. But it’s not that simple. The rancher who took on Sempra had a Goliath of his own: José Susumo Azano Matsura, an heir to a Mexican development empire, defense contractor, high roller and political wheeler-dealer. For reasons that are still unclear, Azano agreed to finance the rancher’s legal battle against Sempra – and perhaps do much more than that. Just weeks before the raid, according to Sempra officials, Azano had threatened to drop a “Hiroshima bomb” on the company. The incident was just one major blowup in the feud between Sempra and Azano, a fight that’s lasted years and led to countless allegations, counterclaims and investigations involving the highest levels of the U.S. and Mexican governments. In the decade leading up to the raid, Sempra, a Fortune 500 company headquartered in San Diego, had established itself as a big player in Mexico. But Azano had the money, power and connections to thwart Sempra’s progress. These days, it looks like Sempra has won the war. Last February, U.S. authorities arrested Azano, accusing him of illegally donating more than a half-million dollars to San Diego politicians. Now, Azano’s massive empire is crumbling. He contends Sempra is to blame for his downfall. The company was the architect of a conspiracy against him, he argues, and has escaped prosecution for crimes it has committed south of the border. Sempra, meanwhile, has wanted to see Azano in handcuffs for a long time. Billions of dollars in energy projects are up for grabs in Mexico, and the company is well positioned to win them – especially now that one of its most powerful enemies could face time in U.S. federal prison. Azano’s accusation that Sempra conspired with American prosecutors against him might sound paranoid. But it wouldn’t be the first time a U.S. company tried to put a member of the Azano family behind bars. Azano’s father, José Susumu Azano Moritani, founded one of Mexico’s largest industrial and commercial development conglomerates. Grupo Azano is based in Guadalajara, the country’s second largest city, and has constructed industrial plants in Mexico for Kodak, Nissan and Renault. In the early 1990s, Azano Moritani built a large manufacturing facility for AT&T. As the plant neared completion, AT&T fired Azano Moritani, alleging he cut corners and missed deadlines. AT&T won a multimillion-dollar arbitration award against him in Mexico, but Azano Moritani fought back in court, and the case reached a stalemate. While the dispute raged, the U.S. Congress was debating the North American Free Trade Agreement, a major piece of legislation that would dramatically expand commerce between the United States and Mexico. AT&T lobbied the Mexican government to prosecute Azano Moritani. Right before a close congressional vote on NAFTA, Mexican authorities, under pressure to show they would protect American investments, arrested Azano Moritani on fraud charges, according to a newspaper account. Azano Moritani remained in custody for 52 days, enough time for Congress to pass NAFTA. Mexican officials released him soon after the vote. Hundreds of Azano Moritani’s employees and supporters celebrated by partying in the streets. The younger Azano’s life is filled with stories that seem stranger than fiction. Wisps of detail about him appear everywhere from Singaporean business registries to the celebrity gossip site TMZ. Azano and his attorneys have declined numerous interview requests for this series and they didn’t answer a written list of questions I provided. Separating the reality of Azano’s life from rumors isn’t easy, but a few things are clear: Azano’s become a big player in the highly secretive world of international surveillance technology, he likes to show off his money and he’s never been far from accusations of fraud and deception. Azano looks more like an overgrown kid than a James Bond villain. He’s short and compact, with a pudgy face and big cheeks. His straight, black hair is just beginning to gray. Azano, who is 49 years old, is of Japanese descent, but he was born in Mexico and is a Mexican citizen. He studied architecture at the University of Guadalajara, and claims that he has a bachelor’s and master’s degree from the University of Massachusetts. But all four University of Massachusetts campuses have no record of him attending their schools. In 1994, Azano became the CEO of his father’s residential development subsidiary. 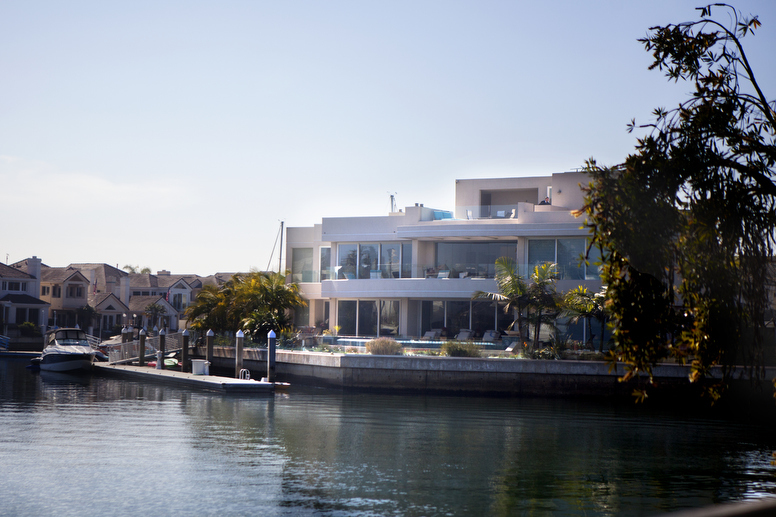 He began developing multiple projects in Tijuana and bought himself a property on the San Diego bay in Coronado. Soon after, he showed up on U.S. authorities’ radar. In 1996, border patrol agents intercepted a car at the U.S.-Mexico border that had 69 pounds of marijuana hidden inside. U.S. immigration officials connected the car’s registered address to Azano. A confidential informant also told investigators that Azano was responsible for smuggling cocaine into the United States. Over the years, the feds have repeatedly investigated Azano for drug trafficking. (In court, Azano’s lawyer has vigorously denied his client had anything to do with drugs.) Federal authorities have looked into Azano for bribery, extortion, money laundering and tax fraud as well. But until now, they had never charged Azano with a crime. People in Mexico have also accused Azano of scamming them as far back as the mid-1990s. One of the projects Azano developed is Hacienda Linda Vista, a working- and middle-class community with a few hundred homes on a hill in northwest Tijuana. The neighborhood only has one way to get in and out because Azano never built the access roads he had promised. Before the project opened, Azano’s company showed off models of the development to prospective buyers. Rafael Martín recalled marveling at the sleek homes and public parks he saw in the model and snapped up a new house. But when he arrived, Martín said recently, his home lacked electricity, carpets and even doors. He later made those improvements himself. “We finished it when we could,” Martín, 53, said outside his house. Martín wasn’t alone. One time, another resident recalled, a hundred people gathered for a community meeting, threatening to beat up Azano over the development’s failures. Azano never made good with all the people who bought his homes. Soon after developing the neighborhood, he moved on to something even more lucrative than building houses: selling spy gear. In 1998, Azano started a surveillance company, Security Tracking Devices. For more than a decade, Azano mostly stayed under the radar, a level of anonymity befitting the clandestine nature of the spy game. But in 2010, Azano hit the big time and, soon after, the headlines. He won a series of secret contracts totaling $355 million with the Mexican defense department. Azano’s company served as the middleman between an Israeli surveillance company and the Mexican government. Azano’s contracts ultimately were leaked to the Mexican press, revealing that the Mexican government was involved in spying that rivaled the controversial programs of the U.S. National Security Agency. Once the government gained access to someone’s phone or computer, it could listen to calls, read email, look at calendars and even turn on and record from a computer’s camera and microphone without its target ever knowing. None of Azano’s other deals has attracted as much attention as the one in Mexico, but he was also doing big business beyond his home country. According to prosecutors, Azano had a globetrotting routine: He would fly into San Diego each week on his private jet, stay a few days, then head out around the world on business. Azano has an office in a bayfront skyscraper in downtown Singapore. According to the Mexican press, he has another office in Dubai in the Tower Burj Khalifa, the world’s tallest building. Around the time he started working with the Mexican defense department, Azano began throwing around lots of money in the United States. 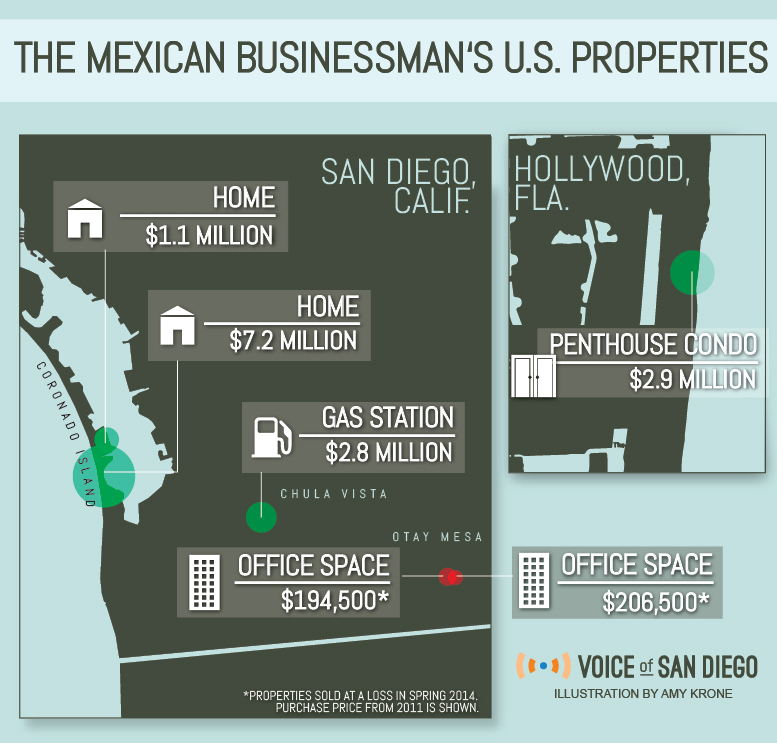 Beginning in December 2010, Azano bought a second home in Coronado, a 40th floor penthouse condominium outside Miami, a gas station in Chula Vista and two office buildings near the U.S-Mexico border in Otay Mesa all within less than a year. The total price tag was more than $13 million. During the same period, Azano fell in with a La Jolla luxury car dealer who fed his addiction to Bugattis and Lamborghinis, and sold him expensive watches and an Andy Warhol print of dollar signs, the dealer said. One night in a Las Vegas club, TMZ caught Azano and his son popping the cork on a $90,000 bottle of Armand de Brignac “Ace of Spades” champagne. Pictures from the evening show Azano, dressed in black, draping his arm around rapper Jermaine Dupri, sharing a laugh. Weeks before the 2011 police raid on their Baja California plant, Sempra executives feared something big was coming. For five years, the company had been involved in a land dispute with a Mexican rancher, Ramón Eugenio Sánchez Ritchie. He claimed Sempra stole a property next to the plant from him. Eventually, Sánchez Ritchie attracted Azano to his cause. In 2008, the pair signed a contract: Azano would finance the rancher’s legal fight in exchange for more than half of the winnings. The shakedown began in December 2010 inside a Mexican courtroom, Sempra said in court filings. Sempra claims that a Sánchez Ritchie emissary told a company lawyer that if Sempra didn’t settle the case, his side was going to “drop two bombs” on the company. The emissary referred to the bombs as “Hiroshima” and “Nagasaki.” The asking price was $200 million to make him go away. Sempra refused. A month later, the son of Ensenada’s mayor received a $2 million wire transfer into his U.S. bank account, according to documents Sempra filed in its lawsuit. Sempra claims this was a bribe from Azano, something Azano has denied. Nevertheless, less than three weeks after the wire transfer, the Ensenada mayor, Enrique Pelayo Torres, ordered the raid on the Sempra plant. The scene at the raid was a mix of comedy and terror. When the officers arrived, a steel turnstile kept them from going any further than the lobby. Police officers and Ensenada city employees tied yellow police tape to the turnstile and made a show of posting signs stating that the plant had been shut down. Camera crews were invited to witness the spectacle. Sempra’s employees gathered in a conference room with a big window that looked toward the plant’s entrance. They could see the cops and their guns staring back at them. Dimas Hernández, the plant administrator who was Sempra’s top official on the site, feared police might turn their weapons on anyone who went outside. Liquefied natural gas, under certain conditions, can ignite with just a spark. The impasse lasted for hours. Eventually, state officials arrived and cut the seals on the outer gates. Just before midnight, the Mexican army marched in and chased the Ensenada cops away without further incident. Within a week of the raid, two more deposits totaling $187,000 appeared in the bank account of the Ensenada mayor’s son, according to the Sempra documents. More bribes from Azano, the company said. In March, Sempra heard back from Sánchez Ritchie’s camp, the company said in court papers. The first bomb had been detonated. The settlement price now was $80 million. Sempra again refused. No one has proven that the wire transfers to Pelayo’s son were bribes from Azano — the court documents show the money came from multiple senders, including a Mexican business. Pelayo has denied that he was bribed. Yes, he said, he knew Azano, but their relationship had nothing to do with the raid. Pelayo said he acted because the plant didn’t have all the right permits. Azano also has said he wasn’t involved. Others drew different conclusions. The FBI found that Azano was in contact with Sánchez Ritchie’s emissaries at the time of the alleged threats against Sempra. The Mexican government investigated and determined Azano was involved, said a former high-ranking Mexican government official who would only speak on the condition of anonymity. Azano wanted to pressure Sempra into a making deal on the disputed land, the official said. “It was clear that this situation was driven by an attempt to force, to cajole, to blackmail Sempra into buying the land next to the natural gas plant,” the official said. Sempra’s plant had been at the center of criminal allegations long before the company started tangling with Azano. But in those cases Sempra wasn’t the victim. The company was the one accused of corruption. Continue on to Part II: Sempra’s Shady Road to Dominance in Mexico. Disclosure: A member of Voice of San Diego’s board of directors serves as vice president for SDG&E and SoCalGas, two Sempra subsidiaries. Tijuanapress.com’s Vicente Calderón contributed to this story. Ari Bloomekatz, Matthew Hose, Michelle Monroy and Gwyneth Shoecraft also contributed. Liam Dillon was formerly a senior reporter and assistant editor for Voice of San Diego. He led VOSD’s investigations and wrote about how regular people interact with local government.